All Precision Therapy® far infrared saunas are made in the USA, featuring high quality lumber and double wall construction. 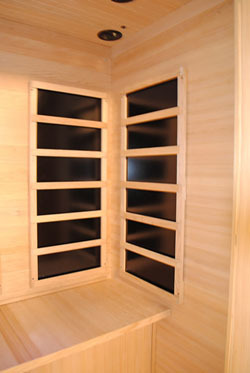 Using seperate tongue and groove panels on the inside and outside provide an insulation gap between the 2 walls, ensuring proper heat retention in your sauna. This same technology is used in building houses. The wood used in these saunas is not the normal 4" wide planks that are found in most saunas. Our saunas use wood that is approx. 2" in width. This helps create a tighter more rigid sauna room and retains heat much better. Using these narrow planks also eliminates the cracking you will find in other saunas. When the saunas heat up, the wood can bow, warp and crack on the 4" planks. The narrow boards that we use will not have any of these issues. Exterior Room Size: Width 72" x Depth 49" x Height 76"
Interior Room Size: Width 69" x Depth 45" x Height 72"
Operating Temperatures: This sauna can heat up to 130f - 140f. Operating Temperatures This sauna can heat up to 130° - 140°. The length of time to heat to full temperature will depend on the current room temperature. If your sauna is located in a room of 70°, it should heat to 120° in 15-30 minutes, which is the most commonly used temperature. Higher temperatures will be reached shortly after depending on the amount of power you have allotted for the sauna's power source. Wall Construction. 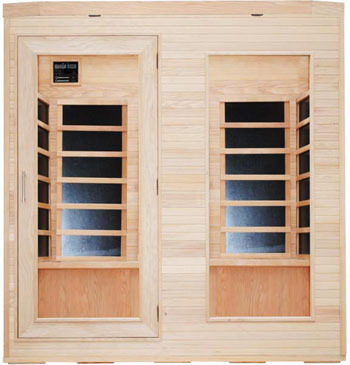 This sauna is built of solid wood, double wall tongue and groove construction. Approx. 40 boards are used in the wall construction to ensure tight fits and reduce heat loss. Wood Finish The interior of this sauna is a smooth sanded finish. No glazes or glosses are used on the inside to prevent against any possible off-gas. The exterior is a water based finish to give your sauna a polished furniture appeal. Window and Door Glass All windows and doors come standard with tempered glass. Tempered glass is required to ensure that in the event that the glass were to break, it would not break like plate glass and have dangerous shards. Tempered glass will simply shatter into non dangerous pieces. Control Panel Soft touch easy read control panel is provided on the interior. You can set the temperature and time with the touch of a few buttons. The timer can be set from 0 to 60 minutes. The temperature can be set up to 140f. Heating System Soft touch easy read control panel is provided on the interior. You can set the temperature and time with the touch of a few buttons. The timer can be set from 0 to 60 minutes. The temperature can be set up to 140f. Ceramic Heaters This unit contains 5 heaters with up to 1500 watts of output power. 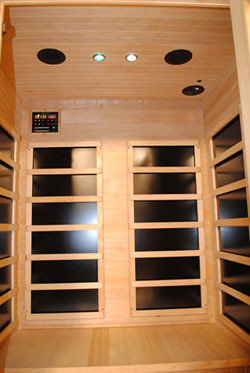 The heaters are high quality ceramic heaters used in most of the saunas on the market today. These are not the metal rod heaters, but have a tightly wound wire over a glass tube interior to ensure the proper far infrared wavelengths are emitted. 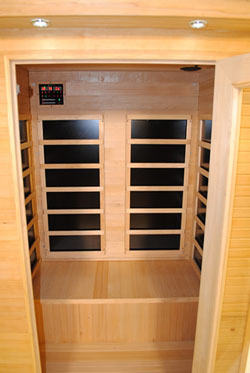 This sauna is approved for use in the United States and Canada, as well as most countries around the world. The marks and logos above are indication that this sauna was tested by the proper organizations. The ETL approval is specifically for the use in the USA and Canada. This item is made to order. Please allow up to 3 weeks for delivery. Ships by Common Carrier Trucking.